"I warn and exhort the brothers that in the preaching that they do, their words be considered and chaste, for the usefulness and edification of the people, announcing to them vices and virtues, punishment and glory with a brief word [e.g. 140 characters]; for the Lord made a short word on earth." The thing is enough to make one laugh—or, it would be more proper to say, to make one weep. After all, the Order does not command us not to be humble: it commands us to do everything in due form. And in matters which concern my own esteem I ought not to be so formal as to insist that this detail of our Rule shall be kept as strictly as the rest, which we may in fact be observing very imperfectly. We must not put all our effort into observing just this one detail: let my interests be looked after by others—I will forget about myself altogether. The fact is, although we shall never rise as far as Heaven in this way, we are attracted by the thought of rising higher, and we dislike climbing down. O, Lord, Lord, art Thou our Example and our Master? Yes, indeed. And wherein did Thy honour consist, O Lord, Who hast honoured us? Didst Thou perchance lose it when Thou wert humbled even to death? No, Lord, rather didst Thou gain it for all. For the love of God, sisters! We have lost our way; we have taken the wrong path from the very beginning. God grant that no soul be lost through its attention to these wretched niceties about honour, when it has no idea wherein honour consists. We shall get to the point of thinking that we have done something wonderful because we have forgiven a person for some trifling thing, which was neither a slight nor an insult nor anything else. Then we shall ask the Lord to forgive us as people who have done something important, just because we have forgiven someone. Grant us, my God, to understand how little we understand ourselves and how empty our hands are when we come to Thee that Thou, of Thy mercy, mayest forgive us. 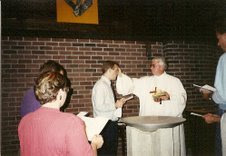 Well, there I am, twenty-one years ago today, receiving one of the anointings from Deacon Ron at little Our Lady of Perpetual Help in Quaker Hill, Connecticut. It was a Saturday. Some of this post I already wrote about four years ago. I apologize in advance. A couple of things have come together in my reflection today: Jesus' encounter with Nathanael (John 1: 45-51), which we have as the gospel for the feast of St. Bartholomew today, and an outing I took with one of the friars yesterday. By way of example, I will tell you about something similar that once happened to me. It was when my brother Bartholomew was still alive. One day he displeased me. Trembling with rage and using a threatening expression and tone of voice, I ordered him to leave the monastery. He immediately walked out, went to one of our barns, and stayed there. When I learned of this I wanted to call him back, but he stated his conditions: he would only return if he were received in his own rank; not in the last rank and as a fugitive, but as if he had been sent away lightly and without just cause. He maintained that he should not have to submit to due process of the Rule for his return, since proper procedures had not been observed in his dismissal. Distrusting my own judgment of this response and of my own actions, and because of the ties of blood between him and me, I entrusted the decision of this affair to the hands of all the brethren. Thus they judged, in my absence, that his return should not be subject to the letter of the Rule since it was certain that his dismissal had not been conducted in a regular fashion. There are occasions when one cannot help doing this [i.e. suffer distraction]: times of ill-health (especially in persons who suffer from melancholia); or times when our heads are tired, and, however hard we try, we cannot concentrate; or times when, for their own good, God allows His servants for days on end to go through great storms. And, although they are distressed and strive to calm themselves, they are unable to do so and incapable of attending to what they are saying, however hard they try, nor can they fix their understanding on anything: they seem to be in a frenzy, so distraught are they. The very suffering of anyone in this state will show her that she is not to blame, and she must not worry, for that only makes matters worse, nor must she weary herself by trying to put sense into something—namely, her mind—which for the moment is without any. She should pray as best she can: indeed, she need not pray at all, but may try to rest her spirit as though she were ill and busy herself with some other virtuous action. These directions are meant for persons who keep careful guard over themselves and know that they must not speak to God and to the world at the same time. What we can do ourselves is to try to be alone—and God grant that this may suffice, as I say, to make us realize in Whose presence we are and how the Lord answers our petitions. Do you suppose that, because we cannot hear Him, He is silent? The other day I went to the library of this friary where I have been staying to look for something light to read (and light to carry) for when I take the subway. For this purpose I was delighted to find the Cistercian Studies edition of Jean Leclercq's Bernard of Clairvaux and the Cistercian Spirit, which I think I may have read before but I can't remember. In any case it's a lovely little book. But I also took it to be a work of Providence that I came across an old paperback edition of St. Teresa of Ávila's The Way of Perfection, which I am now going through for the first time in years. I thought the find perhaps providential because I have been seeking Teresa's example and intercession from time to time lately. Why? I am a small but long-standing theological dubium for which I would like a definitive answer. I last mentioned it on this blog five (!) years ago. The question is this: does, or does not investiture in the religious habit of a (non-Carmelite) religious institute dissolve a previous investiture in the Brown Scapular? On some evening in the years between my first and current time in religious life, I went to some kind of Catholic youth event at Our Lady of Mt. Carmel in Hamden, CT. It might have been 1997 or 1998. The event was organized and led by some Franciscan Friars of the Immaculate. In the course of things, I accepted investiture in the Brown Scapular. Now, since the Brown Scapular is a form of the Carmelite habit, my best guess is that my (re-) investiture in the Franciscan habit in 2001 dissolved my investiture in the Brown Scapular, as it would certainly seem unfitting for someone to wear the habit of two religious orders at one time. Therefore, since then I have not bothered to wear the Brown Scapular nor carry it in any other way about my person. However, I remain open to correction on this point. I was reminded of all this when I saw this video which has been making the rounds. As you can see around 1:15, the friar, a Franciscan Friar of the Immaculate even, seems to have embraced the contrary position. So here I am on vacation, home in the USA. I brought my Italian Liturgy of the Hours to use so I wouldn't forget the little bit of the language I've learned over there. But for those of the Hours that I pray with the brothers, I went and dug out of storage my old Roman-Franciscan Christian Prayer, which was given to me for my use when I arrived as a postulant with the OFM way back on July 17, 1994. (The day is easy to remember because it was the final match of the World Cup (Brazil vs. Italy, 0-0, 3-2 (penalities))). However, when I found my old friend, I saw that it had no ribbons. A breviary with no ribbons? What kind of Catholic do you think I am? I am a convert to Catholic Christianity, a Capuchin friar, and a priest. I hereby renounce anything I may have posted to this blog which is contrary to Sacred Scripture as it has been authentically interpreted by the Apostles and their legitimate successors gathered in ecumenical council and in union with our Holy Father, the successor of St. Peter, or is contrary to the Rule of our holy father St. Francis as glossed by his Testament to the friars. You are free to adapt, copy, distribute, or transmit what I write here, with attribution and a link back to the blog.